I figured I'd show a WIP of a painting I did yesterday. I felt like painting using pretty much just coffee. 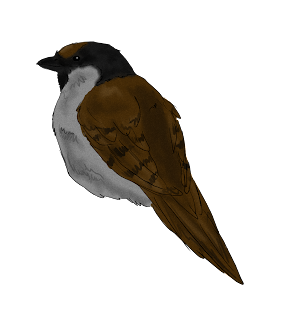 And of course I painted a sparrow!! So, here's a walk through. The finished painting is at the end. The sketch. A little difficult to see, sorry. I start all my paintings with a pencil sketch. The first layer of coffee. Everything gets a coffee wash.
Darkening up the brown areas. This is around 5 washes of coffee. Another 10 or so washes of coffee, and adding the black watercolor. More coffee, more black watercolor. Almost done! The finished painting!! Painted exclusively with coffee and black watercolor! Yay! I was doodling a sparrow and went over it in ink. I'll probably end up coloring this, either colored pencils or water colors . . . we'll see! Drawn on cardboard. Newest photos I've added to A Study in Sparrows. These were taken at the Denver zoo by yours truly! I was bored while watching tv so I sketched up a little sparrow. Yay! Part of A study in Sparrows. 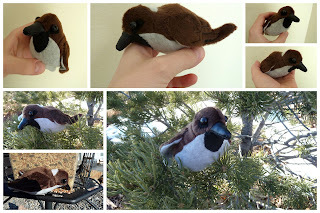 I made myself a plush sparrow!!!! And I named him Buster Keaton! Oh yes . . . I don't think I ever shared this here! I did this drawing for my tattoo on my left arm. It's colored pencil and ink. A mule deer buck with cherry blossom branches for antlers. And the tattoo. I love my deer! My son gave this to me this morning! Love that little guy . . . I have an idea for an art series featuring sparrows. Why sparrows? They're my totem animal and favorite bird!! I have no idea how many pieces I'm going to do. A lot, maybe. Digital art, traditional art, plush, sculpture, who knows?! I'll be posting each piece here, so stay tuned! Confessions of a Coffee Addict. This is where all my personal stuff will be. My rants, raves, my musing on mental illness. Feel free to follow, if you like. Yes, it's been awhile. I haven't had the muse to really write anything. Not that that's bad, I think. I've been feeling quite a bit better. Not perfect, no, but better. Saw my therapist yesterday. We're working on figuring out my cycles and patterns to identify what triggers my depression. Sure to be a daunting task. I see both him and my psychiatrist next week. I had toyed with the idea of starting a new blog - one just to be my online journal - and switch this one back to solely being my art blog. But that seems so . . . . time consuming. I don't know. I may or may not do it. I'd need a good blog title. And I just can't think of anything.